So many women love purples and pinks in the day, but we often forget it's possible to get it quite dramatic for an evening out as well. The general rule of thumb is, the greater the difference between the darker and lighter shade you choose, the more dramatic it can look. The shape of the eye is also more dramatic than usual, with a more angular and elongated wing than I would normally wear. The good news is, it's actually very simple to do and doesn't require many products. All that's left is to keep the lips and cheeks soft and complementary. 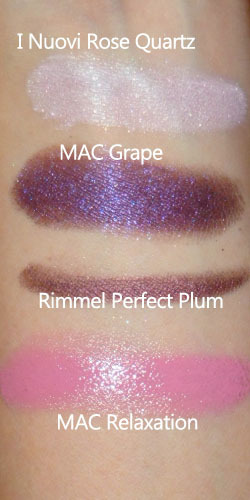 Step 1: Apply a deep purple to the outer 2/3 of the lower lash line, then apply it to the outer half of the upper lids. Following your socket line, extend the outer corners into a wing. Step 2: With a soft silvery-pink, fill in the inner half of the lids, blending the pale shade into the purple you applied earlier. Step 3: The finishing touch is applying a plum metallic pencil (plum works better than pure purple because it's a little more red/pink toned, which works with the purple and pink you applied) to the upper and lower lash lines. If you need, re-assess the shape and decide if you might need to extend your wing a bit more at the outer corners. Step 4: For the cheeks and lips, I kept it simple with a Lip and Cheek cream (MAC Casual Color in Weekend Getaway) in a soft pink. I apply it to the center of the lips with a finger first, and then distribute the remainder onto my cheeks. You need very little on the cheeks, so if you start by applying the product there, you're likely to end up with too much. I Nuovi and MAC are cruelty-free brands. Visit PETA.org for more information regarding animal testing and brands.